1. Preheat the oven at 375 º. 2. On a shallow dish combine the flour, salt and pepper. 3. On a second dish, beat the eggs with 1 tablespoon of water. 4. 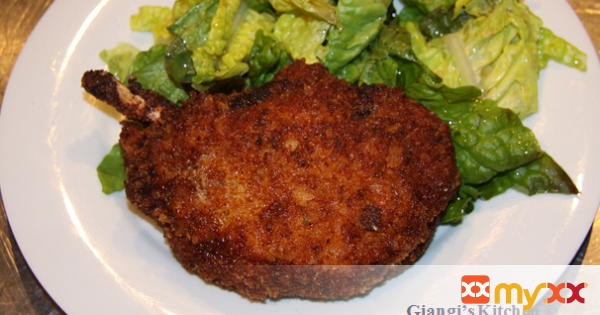 On a third dish, combine the bread crumbs, panko, parmesan cheese and herbs. 5. Coat the pork chops on both sides with the flour mixture, shaking off any excess, then dip both sides into the egg mixture and dredge both sides in the bread crumbs mixture. 6. Heat 1 tablespoon of butter and 1 tablespoon of olive oil in a large sauté pan and cook the chops on medium heat for 4 to 5 minutes on each side, until the pork chops exterior is nicely browned. 7. Place in the hot oven and finish cooking them, 20 or so minutes. 8. Make sure that the chops do not burn or overcook.